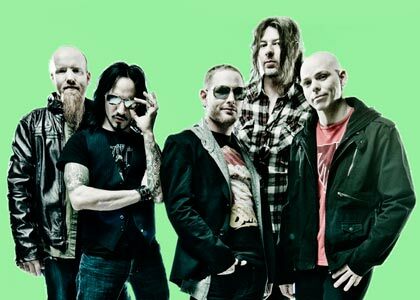 Stone Sour Biography, Discography, Music News on 100 XR - The Net's #1 Rock Station!!! 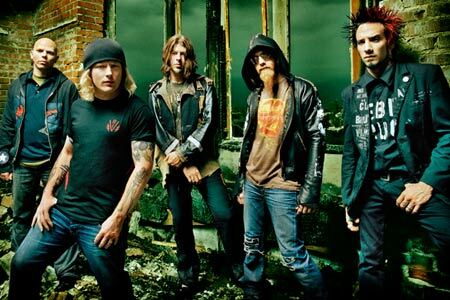 Des Moines, Iowa USA-based, Stone Sour began in the late '90s as the Alternative-Rock recording project of vocalist Corey Taylor and guitarist Jim Root, both also known for their work with the neo-shock metallers Slipknot. With the addition of Josh Rand on guitar, Shawn Economaki on bass and Joel Ekman on drums the band issued their first self-titled full-length CD in August 2002; it was an eclectic album, propelled by the band's busy tour schedule and the contemplative smash single "Bother", which was originally credited to Corey Taylor and was used on the soundtrack for the film "Spider Man"; this song peaked at #2 on The Mainstream Rock chart and at #4 on The Modern Rock Tracks sending the album into the top 50 of The Billboard 200 chart. The follow-up single, "Inhale", reached #18 on The Mainstream Rock chart. 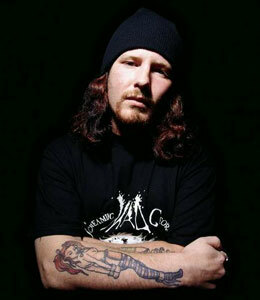 Taylor spent much of 2004 and 2005 supporting his other band but in August 2006, following the replacement of Ekman by ex-Soulfly drummer Roy Mayorga, Stone Sour re-emerged with a brand new album, the sonic blockbuster "Come What(ever) May". The 12-song set enjoyed a 38-week chart run in The Billboard 200 rising to #4 and spun off no less than four Rock radio hits plus the video of the bass drum-heavy "30/30-150"; the first single, "Through Glass" shot to #1 on The Hot Mainstream Rock listing, peaked at #2 on The Hot Modern Rock Tracks and also crossed over into The Billboard Hot 100 top 40. "Sillyworld" hit #2 on the Active Rock chart and fell just shy of the top 20 of the alt-Rock airplay chart in spring 2007; the third single, "Made Of Scars", crested at the #12 position on The Hot Mainstream Rock chart and was followed by "Zzyzx Rd." which enterd the top 30 of that same chart. September 2010 saw the release of the quintet's third effort, "Audio Secrecy" which quickly bulleted into the top 10 of The Billboard 200 Albums chart; the first single, "Say You'll Haunt Me", was busier and more atmospheric than anything on the band's previous outings, demonstrating a more melodic and layered approach to songwriting, it soared to #1 on The Rock Songs and #8 on The Alternative Songs charts. Stone Sour taped a video for "Digital (Did You Tell)" and followed it up with the second Active Rock top 40 hit, "Hesitate". Stone Sour began working on an ambitious double concept album in early 2012 and in the spring the group announced that Shawn Economaki would leave the band for personal reasons. Skid Row bassist Rachel Bolan had laid down the bass tracks on "House Of Gold & Bones, Part 1", this album was released in October 2012 going to #7 on The Billboard 200; in order to promote the album they released two singles simultaneously, "Gone Sovereign" and "Absolute Zero" with the latter peaking at #2 on The Active Rock chart. The second chapter of the project, 2013's "House Of Gold & Bones, Part 2", includes another Rock radio ready hit single: "Do Me A Favor".